This fall, My Pirate’s work schedule shifted from traveling out of town four days a week to an in-town local route without a long commute. After years of us living opposite hours, now he gets up at 5:30 in the morning to go to work and he’s home every night for dinner. I’m thrilled to have him home with me! I really am, despite all the adjustments we’re going through trying to adjust to our new schedule and our expectations. For instance, today (Christmas Eve) it took me an additional 20 minutes to make the custard filled cornbread because I couldn’t find the cornmeal. My Pirate has been systematically reorganizing the kitchen one cupboard at a time while I have my hands full with something else, like cooking dinner. He reorganized my spice cupboard a couple of months ago and threw out anything in a baggy from the bulk section. 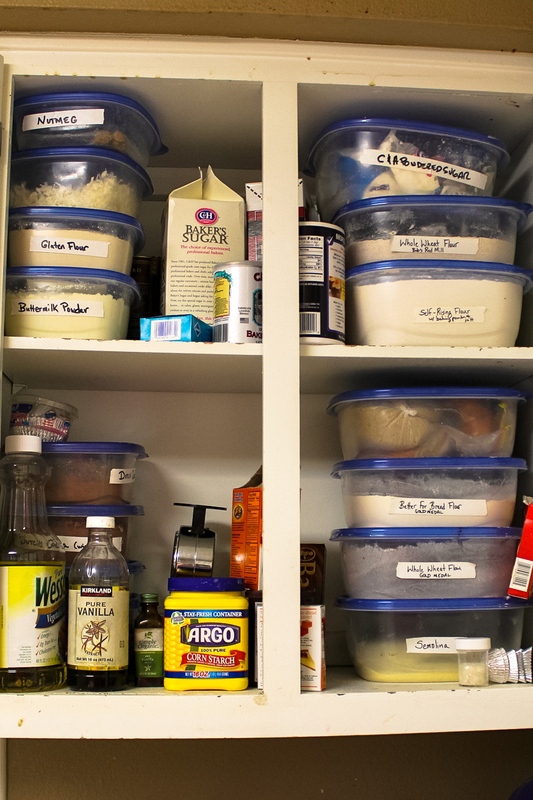 And last week, he reorganized my baking cupboard. I’m not messy, I assure you. I used to know where everything was at by feel and now I’m lost in my own kitchen. My baking cabinet. See, it didn't need any reorganizing! Don’t even let me get started on the refrigerator and the constantly hiding chunk of Parmesan. And on another front, My Pirate expected a gourmet dinner every night of the week after he got home from work. I had spoiled him for so many years on his other route. So, I’ve had to ratchet his expectations back down to reality. When he was out of town, I’d eat a bowl of soup or salad or some leftovers on toast. I was content. When I served him my weeknight dinner, he mistakenly thought that I had just served him the appetizer. Um…no. So, I’ve reeducated him on the romance of sharing scrambled eggs and toast for dinner. And he’s a quick learner for the most part. But, I on the other hand, am lost in my newly organized kitchen of wonders. I think that it’s only fair that I now reorganize the tools in the garage. Don’t you agree? And where did I find my medium grit cornmeal you ask? Why right behind the bag of raspberries in my kitchen freezer. Where did you expect that I’d find it? Now, once you find your chunk of parmesan, I recommend this recipe for quick gourmet addition to your favorite bowl of soup or appetizer. The parmesan crackers are a gorgeous addition to any bowl of soup. The trick is to have a Silpat ($20), a nonstick pad to put in your cookie pan. 1/2 cup of freshly grated parmesan--splurge on the good stuff! Heat your oven to 375 degrees. Make three mounds with the freshly grated parmesan on the silpat in the cookie sheet. Add a pinch of dried herbs like dill and a shake of red cayenne pepper. Bake for 7 to 10 minutes until they form a crisp wafer-like cookie. Remove from the oven, cool, then serve.